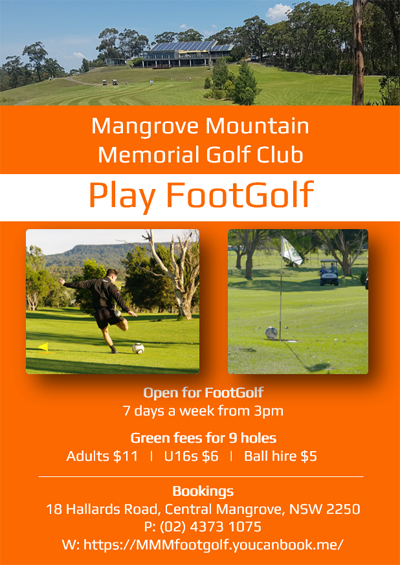 The Mangrove Mountain Memorial Club launched FootGolf on Sunday 26th March from 2pm. Footgolf is a combination of Football (Soccer) and Golf played on the Golf course using mainly Golfing rules. The second round of water quality testing results from Ourimbah Catchment were released today by the NSW Environment Protection Authority (EPA) showing the area to be in good health. 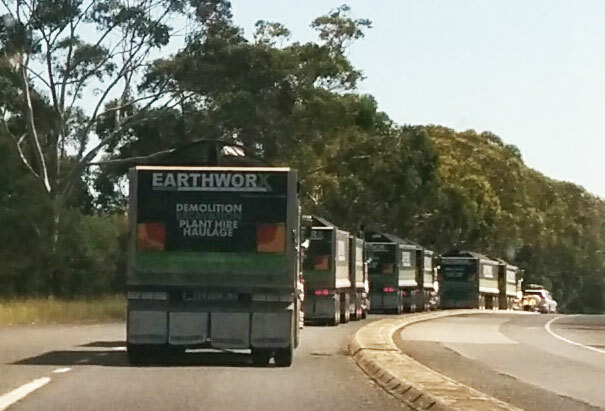 The NSW EPA begun testing the catchment in September 2015 to address community concerns alleging runoff from the Terra Verde landfill in Central Mangrove had entered the catchment. Steve Beaman, the NSW EPA’s Executive Director of Waste and Resource Recovery, said the EPA has met with the Gosford community a number of times and is working with them to address their concerns about water quality in the Catchment. Member for Gosford, Chris Holstein, today said there is no approval for any company to produce Coal Seam Gas (CSG) anywher on the Central Coast. The landfill site adjoining Mangrove Mountain Golf Course will cease operating – plus a new golf course will tee off – within the next 10 years following a ruling by the NSW Land and Environment Court on Friday, 29 August 2014. Gosford City Council’s Chief Executive Officer Paul Anderson welcomed the ruling after months of negotiations with the site’s operator and owner to get the best result possible for the local community and environment. The Board of Directors would like to respond to the latest articles and radio information that Members and Guests may of heard regarding the sale of the Mangrove Mountain Golf Course. 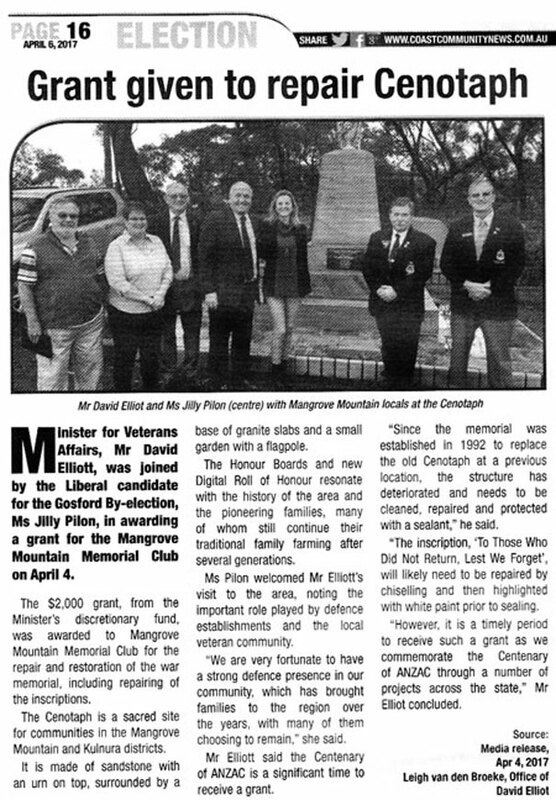 The Mangrove Mountain Memorial Club leases the land that the Golf Course is located on and has a commercial lease on the property for the next ten years with a five year option. The Memorial Club maintains the Golf Course for the community and will continue to do this and provide these facilities for the community. If the land is sold as reported the commercial lease that the Memorial Club have will transfer over to the new land owners. Plans are still in place to extend the Golf Course to an eighteen hole championship course and these plans will remain in place irrespective of who the land owners may be. The land that occupies the Clubhouse is owned by the Mangrove Mountain Memorial Club and is in no danger of being sold and will continue to trade as normal. If any member or guest would like any further information regarding this please feel free to contact Mr Paul Alexander, CEO. NSW Health is warning residents across the state to take extra precautions and protect themselves against mosquitoes following the detection of mosquito-borne viruses in mosquitoes and sentinel chicken flocks. The warning applies to people visiting or living in bush areas or near rivers in and around Sydney, as well as regional and rural areas. People need to take steps to avoid mosquito bites - protect yourself with clothing and repellent; protect your home with screens and remove collections of water around the house where mosquitoes can breed. You can read the full media release from the NSW Health Department here. After being closed for some time, the service station at Peats Ridge reopened just after Christmas 2012 under the Caltex brand, and includes a small convenience shop. Petrol (91 and 98 only) and diesel available. There’s a tourist attraction on the Central Coast that is fast becoming the hottest destination for avid and aspiring anglers to catch sport sized fish. Glenworth Valley’s new Fishing Park is a recreational fishing facility growing Australian native freshwater fish and is now open for fishing amongst 3000 acres of pristine wilderness. There is more information here. Glenworth Valley's Fishing Park is open by appointment daily and bookings are essential. Phone (02) 4375 1222 or visit www.glenworth.com.au for bookings or enquiries. Combine fishing with Glenworth Valley's horse riding, quad biking, kayaking or abseiling activities and save 15% off the regular price. Due to the closure of the Mangrove Counry Club, the Tuesday social tennis ladies have relocated to the Kulnura courts. Tuesdays 9am to 1pm, new members welcome.